Question: Look at the following pie-chart. It shows “the passing rates of different subjects of a school” in the SSC Examination. Describe the chart in your own words. Answer: The pie-chart shows the passing rate of different subjects of a school in the SSC examination There are four subjects showing the chart. These subjects are; Bangla, English, Mathematics, and Science. The graph shows that the highest number of students pass in Bangla and it is 90%. The second highest is in English and this is 89%. Again, 87% of students pass in Mathematics and 74% of students pass in Science. From this chart, it is clear that the highest number of students pass in. Bangla and the lowest number of students pass in Science. From the graph, we can also calculate the rate of failure in these subjects. It is found that 10% of students fail in Bangla, 11% fail in English, 13% fail in Mathematics and 26% fail in Science. If we make a list considering the highest passing rate to the lowest, the serial goes like this: Bangla, English, Mathematics, and Science. 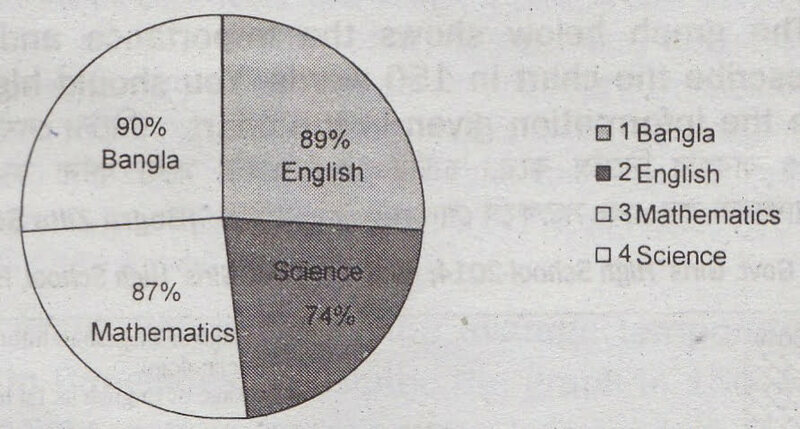 Thus, the pie chart very clearly shows the percentage of students passing in these four subjects.